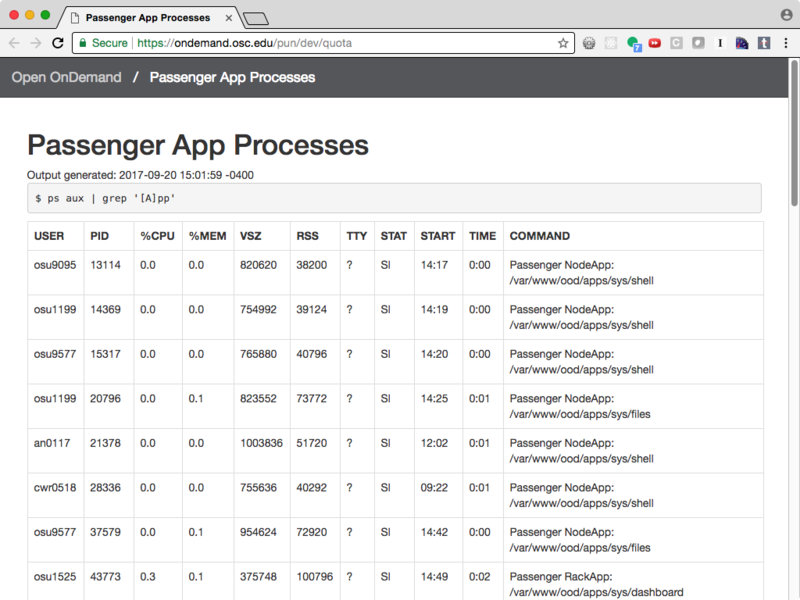 We will make a copy of a status app that displays the running Passenger processes on the OnDemand host. We will use this as a starting point to create a new status app that displays quota information in a table. Fig. 6 What app looks like after cloning and launching. Fig. 7 What app looks like after modifying in this tutorial. This assumes you have followed the directions to Enabling App Development on the Dashboard. The app uses the custom branded Bootstrap 3 that Job Composer and Active Jobs apps use. The navbar contains a link back to the dashboard. On a request, the app runs a shell command, parses the output, and displays the result in a table. Login to Open OnDemand, click “Develop” dropdown menu and click the “My Sandbox Apps (Development)” option. Click “New Product” and “Clone Existing App”. Launch the app by clicking the large blue Launch button. In a new browser window/tab you will see the output of a ps command filtered using grep. Switch browser tab/windows back to the dashboard Details view of the app and click “Files” button on the right to open the app’s directory in the File Explorer. Run the command to get example data. Copy and paste the output into the test, and update the assertions to expect an array of “quotas” instead of “processes” with appropriate attributes. +    assert_equal 1, quotas.count, "number of structs parsed should equal 1"
+    assert_equal "10.11.200.32:/PZS0562/", q.filesystem, "expected filesystem value not correct"
+    assert_equal "99616M", q.blocks, "expected blocks value not correct"
+    assert_equal "500G", q.blocks_limit, "expected blocks_limit value not correct"
+    assert_equal "933k", q.files, "expected files value not correct"
+    assert_equal "0", q.files_grace, "expected files_grace value not correct"
assert_equal 1, quotas.count, "number of structs parsed should equal 1"
assert_equal "10.11.200.32:/PZS0562/", q.filesystem, "expected filesystem value not correct"
assert_equal "99616M", q.blocks, "expected blocks value not correct"
assert_equal "500G", q.blocks_limit, "expected blocks_limit value not correct"
assert_equal "933k", q.files, "expected files value not correct"
assert_equal "0", q.files_grace, "expected files_grace value not correct"
Finished in 0.000943s, 1060.4569 runs/s, 1060.4569 assertions/s. number of structs parsed should equal 1. To run commands like rake through the shell you need to make sure you are on a host that has the correct version of Ruby installed. For OnDemand that likely means using Software Collections with the same packages used to install OnDemand. scl enable ondemand -- git commit -m "initial commit"
This means when I login to the host webtest04.osc.edu the SCL packages will be enabled in a new bash session. If you did the same you would replace webtest04 with the hostname of your development node. Change the command we are using, fix the command output parsing, and fix the struct definition so the unit test passes. -    "ps aux | grep '[A]pp'"
Finished in 0.000966s, 1035.1494 runs/s, 6210.8963 assertions/s. # Define a route at the root '/' of the app. These changes should not require an app restart. Go to the launched app and reload the page to see the changes. Updating the manifest.yml to specify the category and optionally subcategory, which indicates where in the dashboard menu the app appears. git commit -m "update manifest for production"
Fig. 8 Every user can now launch the Quota from the Files menu. Accessing this new app for the first time will cause your NGINX server to restart, killing all websocket connections, which means resetting your active web-based OnDemand Shell sessions. © Copyright 2017-2018, Ohio Supercomputer Center. Theme provided by Read the Docs.